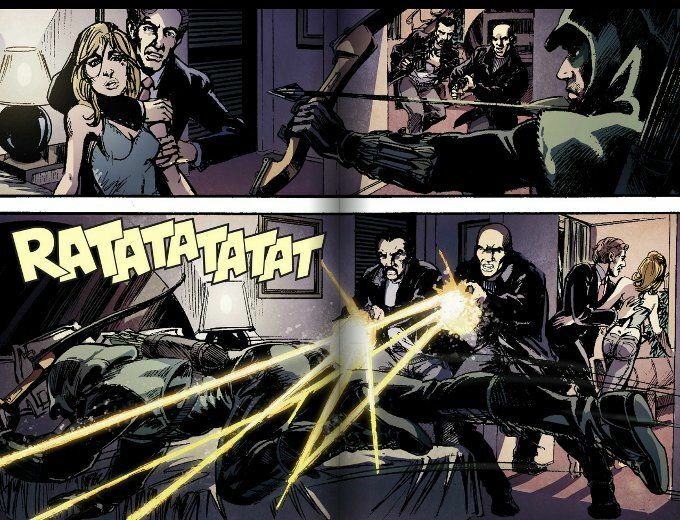 Arrow #6 takes us on our first journey outside of Starling City. Continuing down the list given to him by his father, Oliver sets his sights on Justin Whicker - a businessman immigrated to Russia who is using his connections inside the Moscow Ballet to lure aspiring dancers into prostitution in America. 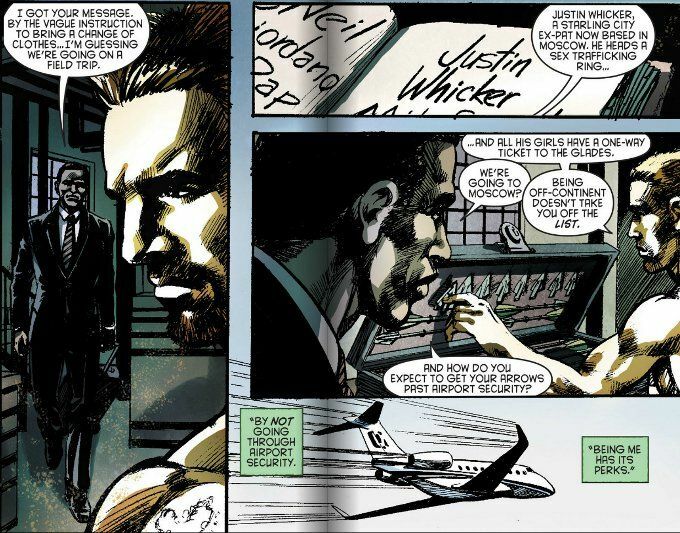 With Diggle in tow, Ollie goes on a good-will mission to Moscow to shut Whicker's business down. The script by Ben Sokolwoski and Lana Cho is serviceable enough, though the exotic setting isn't as well utilized as it might have been. Thematically speaking fighting slavers fits Ollie's Modern-Day Robin Hood schtick to a T and it is nice to see that even though Ollie is still working off his list, he is moving more toward being a true hero rather than an agent of justice. The only really failing the story has is that Diggle has no role in the action and disappears from the comic completely after attending the ballet with Ollie. It makes sense that he'd have to travel with Ollie to maintain Ollie's cover but it would have been nice to see him helping Ollie more directly, as in last week's episode. What really sells this issue is the artwork by Mike Grell. I'm an unapologetic Grell fanboy, so my opinion is inherently biased. That being said, Grell's wotk with the character of Oliver Queen has helped define not only the look of Arrow as a show but defined the character of Green Arrow more than any single creator since Dennis O'Neil. Grell's sense of pacing and anatomy remains undiminished and I don't think any artist can ink their own work so effectively when it comes to invoking a sense of mystery and melancholy.